When you need windows that are a perfect combination of beauty, durability, and low maintenance, choose UltraMaxx® Fusion-Welded Vinyl Windows. Kroll Construction is proud to be one of the few window companies in Michigan certified by Alside® to bring these excellent windows to your home. 1. Fusion-Welded Frame and Sashes — Fusion welding is an assembly method where parts of a frame — vinyl window frames, in this case — are heat-welded, creating a perfectly-sealed frame. As opposed to the more common mechanically-fastened vinyl window frames, fusion welded frames have no gaps or spaces where water and air can seep into. 2. Multi-Chamber Frame Design — The multiple chambers act like an airlock in a submarine; in the event that a part of the frame springs a leak, the chambers trap the leaked air and maintain an effective insulating barrier. 3. Weatherstripping — Similar to the multi-chamber design, the header and sill have a unique four-point contact design that resists even the strongest winds — that’s four layers of tight weatherstripping keeping strong winds from getting into your home. The sashes and jambs feature a triple-barrier design for a similar level of protection against infiltration. 4. Intercept® Warm-Edge Spacer System — Dual-glazed replacement windows in Michigan need non-conducting spacers to keep consistent spacing between panes, and prevent drafts, condensation and heat conduction. The Intercept® Warm-Edge Spacer System has all these features, and retains insulating gas better than most spacers. 5. No-Debris Sill Design — The sills feature a “full-capture” design that channels water straight to the exteriors and keeps water and debris from accumulating at the bottom. 6. ClimaTech® Insulated Glass — The optional ClimaTech glass package features multi-layered low emissivity (Low-E) glass that effectively filters solar heat while letting in as much natural light as clear glass does. The spaces between the panes are filled with argon gas; an invisible, nontoxic, odorless gas that creates an insulating layer and prevents heat transfer — an essential energy efficiency element. 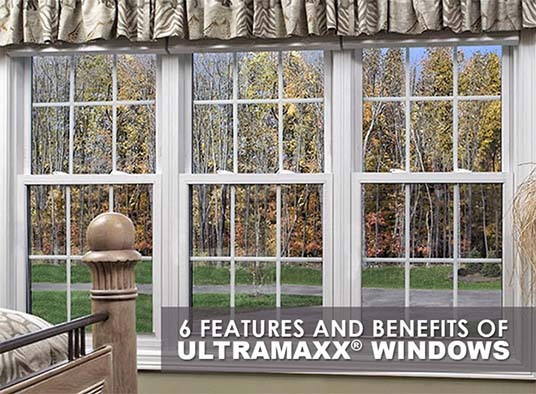 If you would like to know more about getting UltraMaxx vinyl windows for your window replacement in Michigan, call Kroll Construction at (888) 338-6340 or fill out our contact form to schedule a free consultation.